This update contains helpful information for parents who are interested in engaging their children as stewards of the family’s assets. The ability to look at the broader spectrum of a family’s wealth allows heirs to engage in their stewardship responsibilities using their unique talents. Parents are able to intentionally communicate expectations and talk about the why behind the family’s wealth. What is wealth? This question seems like it should be easy to answer. If, however you are finding yourself struggling with how to answer this question, you are not alone. We have found that wealth means different things to different people, even within the same family. As a result, wealth has a meaning that varies from person to person as well as family to family. Why does the answer matter? In our view it can make a family more successful over the long-run. Parents or other senior family members may have more ideas about the “why” behind the family’s wealth, shaped from their experience. A broader definition of what it means to be wealthy can be more inclusive, allowing all heirs to engage in the stewardship of their family wealth based on their unique talents. Let’s start by taking a look at the root of the word wealth itself. “Wealth” is derived from the Middle English welthe, linked to the Old English well or weal, which is patterned on a meaning of health akin to well-being and general welfare more than the idea of pure financial wealth. Much time has passed since the original Old and Middle English term has been in use, but have we moved past wealth being viewed through a more holistic lens? Today wealth tends to be viewed as tangible or intangible things that make a person, family, or group better off. Sometimes an overemphasis on the quantifiable aspects of wealth is more prevalent because they are more tangible and easier to measure. We suggest thinking of financial wealth as a vehicle for a family to achieve its goals. A family’s wealth, also known as the family’s capital, is the sum total of resources a family has to pool and utilize. Understanding the multifaceted nature of the family’s capital can help you start thinking about what goals your family can (and wants to) accomplish – together. 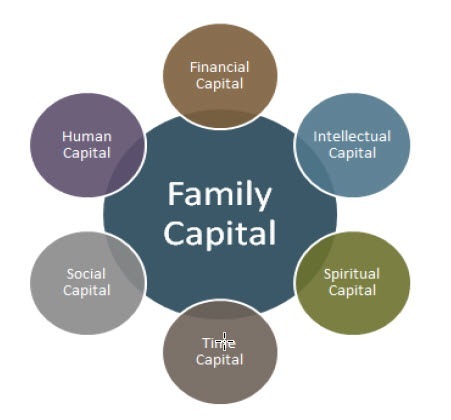 When we think of a family’s capital, we think of at least six dimensions of capital – there may be more, but no less. As you look at the model below, feel free to add in another dimension of capital that is relevant to your family specifically. Financial wealth is defined as the “hard assets” such as cash, real estate, stocks, bonds, etc., that a family owns. Although this wealth is more tangible, how to sustain a family’s monetary wealth is not always clear to each family member. A question you may want to ask: How are we creating clear and realistic expectations among heirs for their financial capital responsibilities? Intellectual capital is often referred to as the “hard skills” family members need to have to be contributing adults. Such skills range from financial, entrepreneurial, and other skills, talents, and capabilities of individual family members. A question you may want to ask: What mechanism(s) do we have to instill and develop these skills for each member? Spiritual capital may include a family’s strong faith tradition, but it’s not just about religion. Spiritual capital includes a family’s values and guiding principles. This type of capital is often accessed when a family understands the deeper meaning and purpose of financial wealth in their lives. A question you may want to ask: What non-financial goals is our family’s financial wealth accomplishing for the family? Time capital is one asset that we often do not think about in the same way as these other types of capital. In today’s fast-paced society where there are so many demands pressing in on us from all sides, many people consider their time to be among their most precious assets, and we each have only 24 hours in a day. A question you may want to ask: How can we leverage ways to preserve our time capital? Social capital includes the family name, reputation, and social standing. For some families, it might also include philanthropy and volunteerism. This style of capital is most visible when the family expresses its values in its passions through action. A question you may want to ask: How do people outside of our nuclear family describe us? Human capital is personal growth and development of individual family members and their physical and emotional well-being. It’s where the issues of self-awareness and self-management come into play and what some today refer to as “soft skills.” Often family engagement and opportunities like family meetings can facilitate human capital. A question you may want to ask: How are we allowing each family member the opportunity to individuate and contribute? We suggest that the phases are not binary, meaning they do not happen at different times. Successful intergenerational families find ways to create and preserve wealth at the same time. The question becomes: In what areas are you creating and maintaining wealth today?